The Community School Cutthroats are headed back to the State 3A tennis tourney Friday and Saturday, May 17-18 in Caldwell with a head of steam and plenty of contestants. Coach Peter Samway’s Cutthroats qualified 16 of its 18 players for state competition during Friday’s 3A District 4/5/6 tournament for three schools and 53 players at Sun Valley Tennis Club. On a sunny and warm afternoon, the Cutthroats swept boys’ and girls’ singles and added a girls’ doubles victory to earn three of the five gold medals achieved in Friday’s one-day tournament. Those players who placed first, second or third in their classes earned trips to the Idaho High School Activities Association State 3A meet Friday and Saturday, May 17-18 at Vallivue High in Caldwell. Winning the Sun Valley independent school’s 15th district championship in 16 years, and ninth straight, the Cutthroats had 154 points for the day—84 in singles and 70 in doubles. The Cutthroats defeated second-place Gooding 73-44 in boys’ totals and beat Gooding 81-33 in the girls’ team total. Overall team points were Community School 154, Gooding 77 and Sugar-Salem 19. Samway’s team qualified 16 for state competition, Gooding six and Sugar-Salem two. Winning boys’ singles was Community School sophomore Willis Sanchez-duPont 6-3, 7-5 over his sophomore teammate George Everitt. In third place, also making state, was Cutthroat soph Trenor Gould. Cutthroat freshman Olivia Ott took the girls’ singles title 6-1, 7-5 over her freshman teammate Hannah Conn. In third place was Cutthroat freshman Blair Baker. Juniors Erin Hennessy and Jolie Blair of the Community School won the girls’ doubles championship 6-1, 6-0 over soph teammates Marleigh Poulson and Isabelle Caraluzzi. 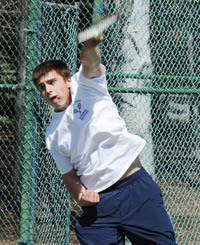 Also earning state berths were second-place Cutthroat boys’ doubles finishers Doug DuFur and Daniel DuFur, third-place Ethan Kjesbo and Reed Roudabush, and third-place mixed doubles placers Nick Wright and Hannah Dies. Sending players to state for the 29th year, the Community School enters the two-day state meet as the reigning State 3A boys’ champions, having beaten Parma 62.5 to 45.5 last May for the eighth state team title in Sun Valley annals. No State 3A champions in the five classes are returning this year, but Parma will be licking at its chops to regain a team trophy—especially since the Cutthroats and Fruitland’s girls kept Parma from carrying home a team trophy last May for the first time since 2006. At last weekend’s 3rd District tournament, the Parma boys defeated Fruitland 72-53, and the Parma girls beat Fruitland 71-65 in girls’ standings.